Arris Agricultural & Environmental has extensive experience in the delivery of knowledge, technology transfer and practice change tools to a wide range of stakeholders and agricultural industries. We have given over 100 workshop and training sessions to farmers for a variety of agricultural commodities (e.g. grains, horticulture, wine, viticulture). In conjunction with our Marketing Communications team, we have specialised in the translation of research outcomes into tools that are used by farmers. Two key elements of these tools are the preservation of the science/technology and the interpretation of the information for use by farmers. 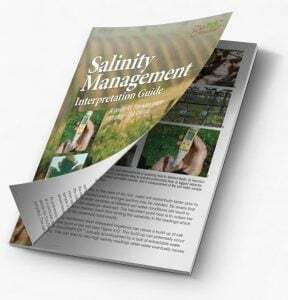 Salinity Management Interpretation Guide-a guide for the wine grape industry (2011) AGWA. This guide is a practical reference for vineyard managers who want to learn more about the principles of ‘best management practice’ for salinity. The following questions are addressed: What is salinity? How is a salinity problem caused? What are the affects of salinity on wine grape production? How can salinity be identified and monitored in a vineyard? How can salinity be managed to minimise future impacts? If your vineyard is showing any signs of salinity, this guide will inform you how to monitor your vineyard (vine, soil and water) on an on-going basis to help identify any developing salinity problem. A PDF copy of this publication can be obtained from Wine Australia. Irrigation of Amenity Horticulture with Recycled Water (2008) HAL. This publication has been designed and written for open space and recreation managers to assist with the understanding and use of recycled water; providing on-the-ground how-to advice. Written specifically for those responsible for the management of the site (ie Superintendents or Acting Superintendents). State and national guidelines provide the framework and the boundaries to manage within. The advice and knowledge is documented in a way that is both useful for day-to-day use and also for those who seek greater information to help improve their recycled water use from an economic or environmental perspective. Healthy Soils for Sustainable Vegetable Farms-Ute Guide (2007) AUSVEG. The Ute Guide provides vegetable growers across Australia with a pictorial reference tool to assist them to measure, record, interpret, manage and monitor the health of their soil and to put in place practices that will maintain and restore soil health, sustainability, productivity and profitability. The definitive Australian reference on the principles of using reclaimed wastewater for agricultural purposes. This comprehensive work examines the fundamentals required for reclaimed water schemes to deliver sustainable farming operations that achieve the yield and quality of produce necessary for acceptance in the market. Growing Crops with Reclaimed Wastewater reviews the historical background of water treatment, its use and disposal from Australian wastewater treatment facilities and the technologies now utilised to treat our wastewater for reuse. The major concerns of chemical, physical and pathological qualities of reclaimed water are addressed, ensuring that the environmental, economic and social requirements of today’s society are met. It reviews the state and national regulatory requirements and guidelines that have made Australia a world leader in the management of reclaimed water and also examines the guidance in the United States of America (Federal) and in California, the World Health Organization guidance and the situation in Israel. This is the first time such a definitive review has been produced on the use of wastewater for horticulture and it is a key tool for decision makers, researchers and practitioners to understand the main issues and constraints. It will be of particular interest to agricultural scientists, waste and horticulture consultants, engineers, planners, state agencies, environmental officers and students. The Grains Research and Development Corporation (GRDC) has identified subsoil constraints as a major barrier to production in the agricultural regions in southern Australia. Dryland salinity associated with shallow or rising ground water table affecting the productivity of a significant amount of land as a result of the associated salt scalds and accumulation of salt in the soil is currently given wide attention in the public debate and in government policies. These constraints in the root-zone limit root and crop growth and/or function, reducing growth and yield. This manual aims to increase growers’ understanding and awareness of these problems, a guide to farmers and advisors, it gives a brief account of sodicity, transient salinity and alkalinity, which are major subsoil constraints in the cropping regions of southern Australia. This Horticulture Australia Limited project has played a pivotal role in helping the ground-breaking development of a sustainable reclaimed water scheme in the Virginia Triangle, South Australia (one of the largest Class A reclamation and reuse schemes in the world). It has secured a safe, environmentally friendly and guaranteed water source for a diverse range of horticulture in SA. Australia now has some of the world leaders in water reclamation and reuse industry. The knowledge acquired during this project has been captured in new projects funded by Horticulture Australia Limited, that help coordinate reclaimed water development in horticulture across Australia; maximising the potential benefits to Australian horticulture. After 10 years of fluid fertilizer research a need was identified to collate and package the research information for farmers, agribusiness and researchers. Therefore, a manual was prepared with the aim of providing a review of the South Australian (SA) experience with fluid fertilizers in dryland agricultural systems. 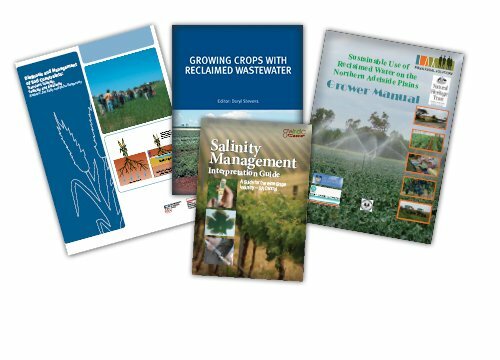 The Manual is a legacy of the concerted fluid fertilizer research effort in South Australia over a decade. It provides a starting point for agriculturalists investigating management practices for fluid nutrient sources and highlights the issues that need to be considered when making fluid fertilizer decisions. We continue to receive feedback that Australian farmers and agribusiness are consulting the manual when considering their fertilizer management options. Of all the inputs that drive the vegetable industry, adequate quantities of good quality water for irrigating crops is one of the most critical issues the industry currently faces. Key messages; Water use efficiency is a critical issue for yield and profit in the vegetable industry. To demonstrate relative efficiencies for water use it is essential that growers measure the amount of water applied. More accurate on-farm data in relation to water use will help set benchmarks and to demonstrate to the wider community the already efficient water use practices of the vegetable industry. Copies of Arris publications are available upon request.